I have always been curious about the name of my 2nd great-grandfather, Francis Marion Minor. Neither Francis nor Marion makes an appearance among family tree leaves until his birth in 1828, a strange happenstance in an era that often confounds modern genealogists with its generation-lapping of names. So what’s up with John Pierson and Isabella McClelland Minor in 1828? An area newspaper, the Washington Reporter (Washington, PA) carried the musings of a Mr. Sample on its front page in January 1825 about Brigadier General Francis Marion. The South Carolinian was known among American Revolution veterans as the Swamp Fox for his daring guerrilla tactics against the British forces occupying the southern coast. His movements against a superior force were credited with forcing the redcoats’ evacuation. And during the 1820s General Marion was still being remembered as a prominent revolutionary hero, comparable in intelligence, benevolence, and bravery to the illustrious General George Washington. John and Isabella were raising their children where they had been raised, in Greene Township, Greene County, Pennsylvania, just outside the village of Garards Fort–an area developed by the revolutionary generation. As those community members aged, and began to die out, there was a heightened sense of that generation’s role in the country’s freedom and enfranchisement. To honor and commemorate the grit and determination of their predecessors, parents named their children for people they had never known but would always admire. And that is how I think my great-great-grandfather got his name–Francis Marion Minor (1828-1918). The tooled leather volume resembles a family bible, ornamented by the addition of a bronze latch. The heavy cardstock pages are cut out in the middle allowing for two cabinet cards to be displayed, back to back. A thick gold line frames each photograph. Buckled into the Minor Album are twenty-eight portraits taken between 1860-1900. JUST WHAT DO I HAVE HERE? THIS is the title page. Gorgeous!! Right? MEH. I want story. Story comes from details. Let’s start with the known. The album was recovered by my mother from the attic of the farmhouse in which she grew up. In which her father grew up. In which her grandfather and his father grew up. From the attic of the Minor Home Farm on Ceylon Lane, purchased by John Pearson Minor circa 1830. Just who, then, might have purchased the album and slipped the cabinet cards into place? My mother’s father’s grandmother, Mary Jane Gwynne Minor. Women of the Victorian era were associated with the collection of family memorabilia and its display; photograph albums were part of this creative work. Mary Jane was the woman of Ceylon Lane, the mom of the Minor Home Farm, during the period that this album was filled. This hypothesis has been strengthened by my work comparing other labeled photographs in my collection with those that I am finding inside the album. I have identified several images as members of the Mary Jane and Francis Marion Minor Family. My sleuthing adventures begin with this hypothesis–the cabinet cards of the Minor Family Album belonged to Mary Jane and Marion Minor, and represent members of their immediate and extended family. Next post– Mr. Chin Whiskers is revealed. With my trusty Flip Pal scanner, I captured this image of a family heirloom. The photograph is snugly framed, with a sturdily nailed backing that I didn’t want to disturb. So I did the best I could and scanned from on top of the glass. The image will be useful in identifying other photographs that my mother is letting me take home, since we know the identities of these folks. Seated are my great-great grandparents, Mary Jane Gwynn and Francis Marion Minor. The little boy standing to their left is my great-grandfather, Robert Minor. 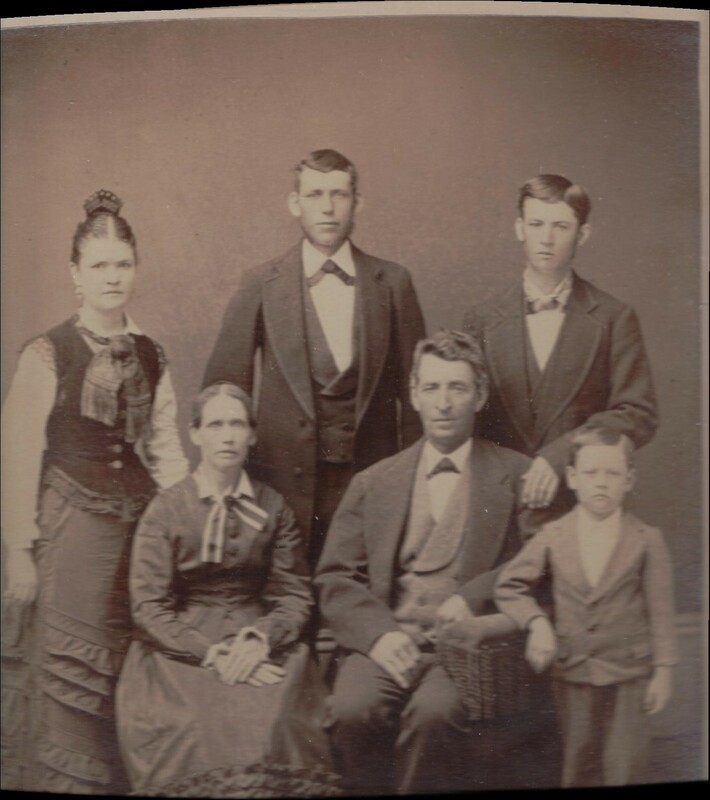 Standing behind the trio are the older children – Sarah Priscilla, John Pierson and Olfred Minor. I know that Robert was born in 1869, and he looks to be about 5 or 6 here; T W Rogers of Carmichaels, Pennsylvania took this photograph sometime in the mid-1870s then. Project 150: It’s 1861. Farm On. Project 150 is a series of Civil War posts that, taken together, will tell the story of my family’s life choices during the years of rebellion. Sources used for today’s post include privately held family documents, a Wiki article on the election and the Federal 1860 census accessed at ancestry.com. My great-great-grandparents, F. Marion and Mary Jane Gwynn Minor, woke up each day of 1861 inside a farmhouse on Ceylon Lane. Each night they tucked their three children, John (age 9), Olfred (age 6) and Sarah (age 3), into bed. When they attended Goshen Baptist Church in the nearby village of Garard’s Fort, Marion and Mary Jane drove past brother Samuel Minor‘s family home. Driving to the nearest town, Carmichaels, took the couple past the homes of Marion’s parents, John P. and Isabella McClelland Minor, and his sister, Isabella Minor and Hugh Keenan. The families were four of the ninety-eight that called Greene Township, Greene County, Pennsylvania home. Within its sixteen square miles, the township had 134 women housekeeping and keeping all that was in the house – the stories, the children, the meals, the cleaning, the mending, the tending, the healing. The hills also sheltered 105 farmers and day laborers, 5 shoemakers, 4 carpenters,3 merchants, 2 clerks, 3 seamstresses, 2 millers, 2 stonemasons, 2 stonecutters, 2 washerwomen, a shinglemaker, a chairmaker, a cattle drover, a physician, a blacksmith, and a coal miner. All but two families were white, and all but twelve residents were born in Pennsylvania. Most everyone could read and write. The township’s wealth was concentrated in the hands of the merchants and three farming families: the Lantzes, the Gerards and the clan of John P. and Isabella Minor. John Pierson (Pearson) subscribed to the Waynesburg Messenger, an instrument of the Democratic Party. Shared among the extended family, the pages were no doubt well thumbed; the articles frequent sources of conversation and debate. Greene County voters had handed the county to the pro-slavery Southern Democrat, John C. Breckinridge, in the 1860 election. As the country staggered toward dissolution in 1861, Marion bought twelve head of cattle from Philip Wolf for $140, and another three for $25. A bit later he purchased one from John Ramer for $24.20. As Abraham Lincoln settled into the White House, F. Marion bought ten more head at $60. Throughout the summer of 1861, as volunteers formed companies and regiments and brigades, the Minors of Ceylon Lane farmed on. Walnut and oak trees were felled for logs, planks and rafters; stable flooring, joists, and sills. Stables were built, homes repaired; livestock bought, fed and sold. Into the fall the family farmed. John P. purchased 50 bushels of coal for $5. John P. Junior and Olfred probably climbed the hill to the family schoolhouse when they could, and climbed trees to shake out nuts when they were asked. As the days folded into long nights, the Minor business of tending children and raising cattle continued to thrive. This is to certify that I, Elias Slocum, waid for TB Martin and Dan Shore 42 hed of cattel sold to Pearson Minor the cattel was in a fair condition to when waid. On December 30, 1861 John P. Minor made one last entry in his business ledger: Lindsey paid me $487.00.